happy february!!! we made it through the month of january, which felt like forever. we are one month closer to spring & exactly two months until bake the seasons is released! over the last few weeks, i have been working on a lot of fun valentine's inspired recipes & i can't wait to share them all with you. i love creating holiday themed desserts & valentine's is no exception! 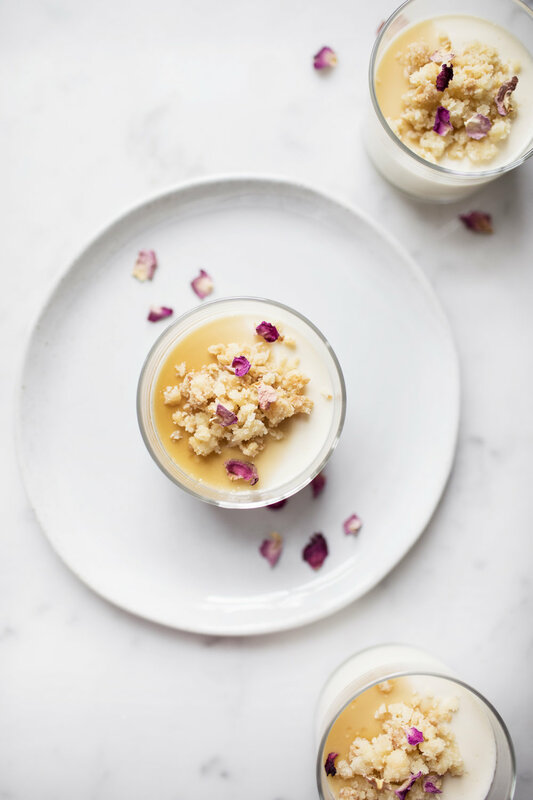 this lover's leap panna cotta might be one of the simplest & prettiest desserts to date. it is so decadent & beautiful! the dried pink rose petals really add a romantic valentine's vibe to the final panna cotta. i can't believe it, but this is the first panna cotta recipe i have shared since i started blogging. what! it is such an elegant & easy dessert to make. it is perfect for a romantic valentine's date night as it can be prepared the day before. this panna cotta feature's steven smith teamaker's limited addition lover's leap tea blend. the tea is a delicate & fragrant marriage of high grown ceylon tea from lover's leap tea estate, blended with pink rose petals, chamomile petals & citrus. it works so well in this dessert as the flavours come through strong, but don't be afraid to experiment with other flavours once lover's leap is out of season. lightly grease six 6 oz ramekins & set aside. add half & half to a medium sauce pan. sprinkle an even layer of gelatin powder over the top. allow stand for 5 minutes, until the gelatin begins to soften. place sauce pan over low heat and whisk in gelatin. add the tea and sugar. continue to stir until the sugar dissolves. no NOT bring mixture to a boil. once the gelatin and sugar are fully dissolved, remove from heat add the vanilla, salt & heavy cream. allow mixture to stand for 10 minutes before removing the tea. note: if using sachets, squeeze out any excess liquid from tea bags. evenly divide mixture into prepared ramekins. place ramekins in fridge and let chill for at least 4 hours. before serving top with shortbread crumble, a splash of maple syrup and dried rose petals. while the panna cotta chills, prepare the shortbread crumble. Preheat oven to 350 degrees and line a baking sheet with parchment paper. in a bowl, add the brown sugar, flour, salt and butter. using your hands, work in the butter until a pea sized crumb mixture is formed. mix in the vanilla extract & lemon zest. turn out onto prepared baking sheet & let chill in the fridge for 10 minutes. bake for 8-10 minutes, until the crumbs are golden brown. allow mixture to cool completely before topping panna cotta. this post was created in partnership with steven smith teamaker! find the lover’s leap tea blend here. available in sachets + lose leaf.